Robert J. Shiller has 1 media appearance. While the finance industry must shoulder its share of blame for the economic downturn, Shiller, economist and author of The Subprime Solution and Irrational Exuberance, argues that it shouldn’t be condemned outright. Rather, with innovation and redefined roles, finance can contribute to the common good. Robert J. Shiller discusses The Subprime Solution: How Today's Global Financial Crisis Happened, and What to Do about It. Robert J. Shiller is currently considered a "single author." If one or more works are by a distinct, homonymous authors, go ahead and split the author. 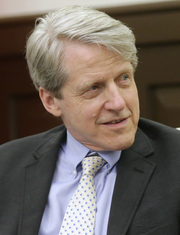 Robert J. Shiller is composed of 3 names. You can examine and separate out names.